I saw a similar version of this cute Valentine’s Day classroom wall decoration on Pinterest and I knew I wanted to make one. The idea is to make the paper on the wall look like a ruler and then the kisses are used instead of numbers to see how tall you are. I thought it would be a great addition to our classroom. I was right, the kids loved measuring themselves against the Hershey kisses and counting how many kisses tall they were. It doesn’t take up too much room. The one I made was two pieces of construction paper wide. The picture doesn’t do it justice, it really is adorable. It would make a great decoration for a day care, preschool or young elementary school students. Step 1: Tape construction paper to the wall to make the “ruler”. I made two columns wide and made it 6 ft tall. I had long construction paper. I used 10 sheets. I used purple paper, but you can use any color. Step 3: Now it’s time to make the kisses. 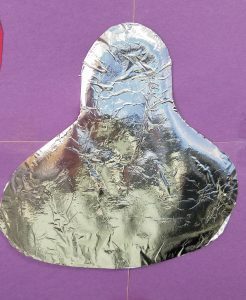 You can print out a tracker on-line by googling Hershey Kiss clip art or you can make one free hand. After you cut them out, glue aluminum foil to one side. You will need to make 6-8 kisses depending on the size. Mine were the size of a 9×12 piece of construction paper and I made 6. Step 4: Next, you are going to tape the kisses to your “ruler”. Try to leave an equal amount of space between each kiss. Add a sheet of paper next to your “ruler” and have the kids write down how many kisses tall they were next to their name. When everyone has been counted. Make a chart on how tall the kids were. I hope you enjoy this Valentine’s Day classroom decoration as much as my kids did!